Soon after the young students file into the classroom, the children’s broad smiles and an even larger desire to learn are quickly observed. The students’ cheerfulness and enthusiasm is mirrored by their teacher and Upper Iowa University alumna, Montana Van Sickle ’15. 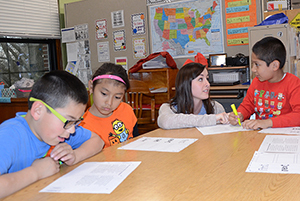 An English Language Learners (ELL) teacher for Des Moines Public Schools, Van Sickle teaches English as a Second Language (ESL) to students in kindergarten and grades one and three at South Union Elementary, and grades three thr ough five at Howe Elementary in Des Moines, Iowa. Graduating with a bachelor’s degree in education, Van Sickle also earned her K-8 reading, K-8 language arts and K-12 ESL endorsements while attending UIU. Entering just her second year of teaching, the Hawkeye, Iowa, native has already provided English instruction to elementary students with ties to countries such as Mexico, El Salvador, Nepal, Somalia, Vietnam, Burma, Thailand and Sudan. 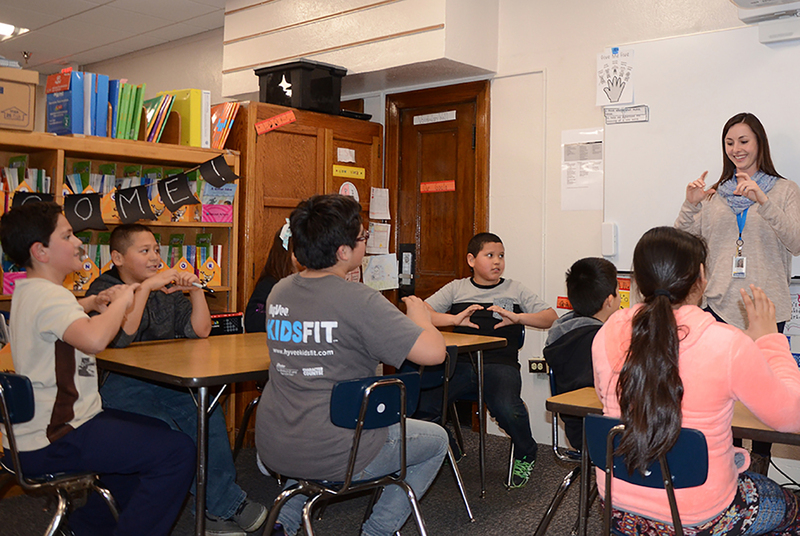 An advocate for the ELL population, Van Sickle explained her duties and goals are to help students acquire the English language and provide each of them the appropriate background knowledge and vocabulary required to succeed in their academic and social lives. She noted the biggest challenge during her first year of teaching was meeting the diverse needs of all the students she worked with daily. “These children come from various backgrounds and have a wide range of emotional, social and academic needs,” explained the former UIU Education Club president. “I’ve certainly become attached to ‘my kids’ and they have impacted my life, both professionally and personally. Van Sickle credits her alma mater with providing her the skills and hands-on experiences needed to prepare her for a leadership position in the classroom. She especially praised the Andres School of Education faculty and staff for their continuing advice, guidance and support. In addition to continuing her role as an ELL teacher, she is looking forward to joining the Howe Elementary School staff in 2016-2017 as one of six Des Moines public schools chosen in the rollout of Schools for Rigor. An additional 27 Des Moines Public Schools will begin the transformation in 2017-2018, with the remaining schools to follow the ensuing school year. Howe Elementary and the other five initial schools will become demonstration sites where teachers and administrators from other schools will be able to witness, first hand, what truly rigorous teaching and learning looks like.